There are so many very important articles on the victimization of women in society. And this is not one of them. Nope. This is an altogether different take—this is about when the male writer feels threatened by the empowered female writer. Is it because he does not understand her? Is it because she does not fit his mold of the iconic “writer” model, complete with a tweed jacket and dark-rimmed glasses, and —of course—a penchant for craft beer? It could be one of many reasons, including the simultaneous exoticizing and diminution of women who write. Being a female and a writer has its interesting twists (I purposely am not saying “woman writer” or “female writer” because we rarely make the distinction “man writer” or “male writer”). Women need to have their voices heard, but they don’t need their voices to be ghettoized into a special bookstore category of “women’s writing.” This suggests that men’s writing is the default and that women’s writing is some sort of sub-category, or—worse—something that happens far off on the exotic island where women write, certainly not on the main continent of male writing. I am one of the founders and Executive Artistic Director of a literary organization, the Cambridge Writers’ Workshop. We have been leading writing workshops and retreats since 2008, and coincidentally, the founding co-Director and Executive Creative Director, Rita Banerjee, also happens to be female. We are always surprised when, occasionally, people assume that we are a women’s-only organization simply because the directors are women. Something tells me the same would not apply if the directors were male. In fact, we have a balanced ratio of men and women on our executive board and our summer writing retreat in Paris this summer, for instance. Also, there are men as well as women who serve as our faculty members on our retreats. The anthology that several members of the Cambridge Writers’ Workshop are editing, CREDO: An Anthology of Manifestos and Sourcebook for Creative Writing, also has a balanced representation of genders. There are several problems I have with ridiculing a female Flamenco dancer image. Is it the figure of a powerful female dancer, or the Romani (Gypsy) heritage that is being mocked? The commenter assumes that this image cannot be associated with serious writing. What of Lorca and countless other writers who have been inspired by Flamenco and Andalucia? The thing that strikes me is that this same commenter had nothing to say of the iconography of a lighthouse on our Newport retreat poster or the Eiffel Tower on our Paris retreat poster, which was also posted to the forum. 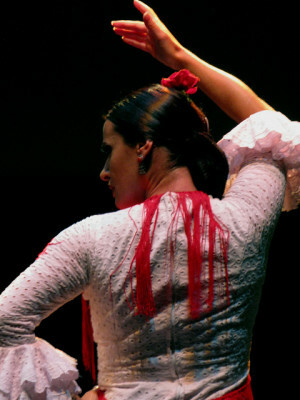 But the female Romani Flamenco dancer on our Granada poster…for him, this seemed an easy target! I am going to make a suggestion—one that, I admit, makes an assumption. I am going to assume that he simply could not process the power of this image, and perhaps it even threatened his limited world view. Yes, the body of a beautiful woman of color dancing can exist in a non-sexualized context—in the context of a serious writing workshop, with serious faculty committed to the writing process. Publically, on the forum, he accepted my apology, but in a private message to me he wrote: “Well…since our workshops focuses on actually producing work rather than retreats, there’s really not that much competition.” More defensiveness covered in seeming nonchalance. Poor man, I thought. Did he not know what a retreat could do for a writer? So many of us writers are holders of day jobs, with family responsibilities. A retreat, as any serious writer would know, can afford the necessary space and time to complete a project and move our writing goals forward. Many of our writers have finished novels, poetry manuscripts, screenplays, and more on our retreats. Another male writer ridiculed the yoga component to our retreats, asking, “Why yoga? What does it have to do with writing?” He questioned the seriousness of the workshop, but later expressed that he really wasn’t that flexible.